I am excited to say that I completed all 25 Acts of Kindness in 16 hours on Monday. It was quite a day! I am still exhausted from it… but it was amazing. I could not imagine a better way of spending a birthday. I wanted to share my 25 acts with all of you and hopefully hear from some of you about your acts. I have already received a few stories which I will post over the coming days. If you would like to share what you did please e-mail me at lynsey.hodgson@gmail.com. It is amazing to see the impact that my little birthday party had across the world!! 1. Write a letter to my parents. 2. Share Karri’s story and the Karri Hour Message and Website. (If you missed it you can read about it HERE). 3. Write and mail a letter to a close friend/inspiration (not yet received so I don’t want to ruin the surprise). 4. Write and mail a letter to another close friend/inspiration (not yet received so I don’t want to ruin the surprise). 5. Write and mail a card and donation to Young Adult Cancer Canada. Thank you Mom, Becky, and Auntie Jeanie for contributing! 6. Smile at someone I don’t know…. this continued throughout the day. 7. Buy the order of the car behind me in the Tim Horton’s Drive Thru and give them a “Happy Monday” card. 8. Write a card and get Jenna Guelph Storm Tickets. Jenna is the creator of Jenna’s Jems. She makes handmade bracelets to raise money for the Brain Tumor Foundation of Canada and to help support my medical expenses. 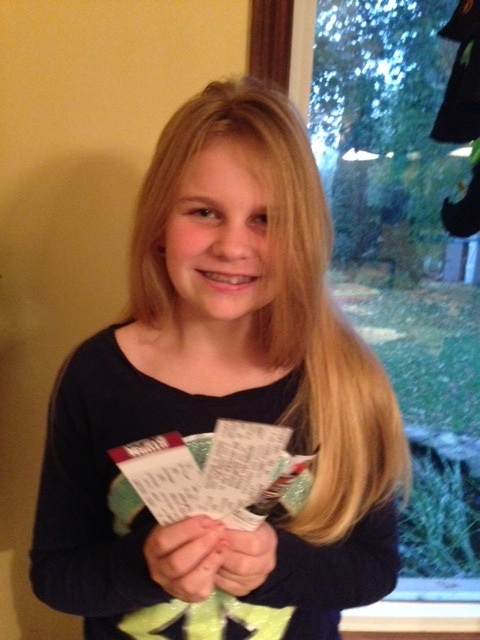 Jenna with her Storm Tickets! 9. Hold a door for someone… this continued throughout the day. 10. Distribute compliment cards… this also continued throughout the day. 11. Deliver homemade soup and muffins and babysitting and cleaning vouchers to a close friend who just had her 3rd baby. 12. Drop off Zehrs receipts to Big Brothers Big Sisters of Guelph. Thanks to everyone who donated theirs! I had an entire shopping bag full! 13. Deliver home made food to the Welcome In Drop In Centre. Thank you to my Mom who made beef stew, my Mother-in-Law who made chili, Auntie Jeanie who made shepherds pie, and Steve for helping me make blueberry muffins, quiches, and broccoli casserole. This was my favourite stop of the day. They were SOOOOO happy to receive all of this food. You could tell how gratefully they were. My mom and I will be making this a monthly tradition. We are thinking the last Monday of every month taking a big batch of something to them. If anyone else would like to participate please let me know! It is a wonderful feeling to see first-hand how grateful people are, especially for something most of us take for granted. 14. Take food to the Guelph Food Bank. Thank you Grandma Joyce, Mom, Larissa, Kimbo and Stevko, Pieter and Anne, The Myles, and anyone else who dropped off a donation while I wasn’t home! 15. Donate clothing, food, and other essential items to Lakeside Hope House. Again, this organization was SOO appreciative of the donations. We had an entire van full of donations! Thank you to Jen B. for organizing a clothing drive (I’m sorry I don’t know everyone who donated to her), Larissa, Kimbo, The Myles, and my mom for their donations. 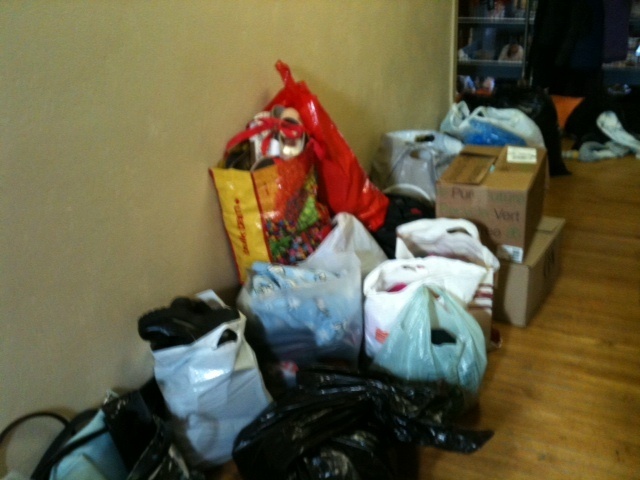 About half of the clothing that was donated to Hope House. 16. Write a thank you card and deliver a cake to all the staff at Cutten Fields. They are the best employer, and everyone there has been so wonderful, supportive, and generous to me these past 2 years. 17. Take Jasmine, my Little Sister, out for lunch. 18. Fill a shoebox for Operation Christmas Child. Thanks Jasmine for your help with this! 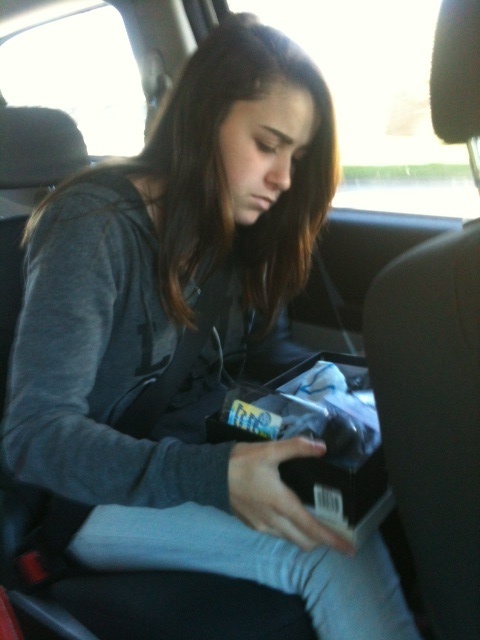 Jasmine packing the shoe box! 19. Deliver a card and Edible Arrangement to Lexi, Karri’s sister. 20. Deliver homemade soup and muffins and a babysitting and cleaning voucher to a close friend who just had her 1st baby. 21. Now… an act of kindness towards myself… Make a list of 25 things I am grateful for. 23. Pick up garbage. Thanks Steve for your help! 24. Organize a blood drive. Highlight of the day! HUGE thank you to everyone who came out… especially those first time donors. You were all so brave, and helped many people with your donations. Thank you to those who donated before or after my actual birthday as well. 25. Dedicate a song to “My Firecrackers”. If you missed this, please read it HERE. PHEW… I am exhausted just writing that all! What a day!!! An amazing, beautiful, motivating, inspiring…. and exhausting day! Thank you to everyone who helped make this day possible! Those that helped by making food for the drop in shelter, donated food and clothing, donating Zehrs receipts, helped with rides, and participating in the blood drive. You helped create a day so much more than I could have imagined. Thank you! – since my diagnosis I feel I have re-connected with many long lost friends. We may have lost touch over the years since high school or University… but my diagnosis brought us back together. For that I am very grateful! Even if I did not know you before getting sick, I feel like we are long lost best friends. You always have my back, and I always have yours. Thank you for making me feel so comfortable and at home with you. – every Firecracker has been through some sort of struggle or challenge… and it is these hard times that really have brought us all together. What an amazing feeling!! As the song says “these bruises make for better conversation”, these tough conversations are the ones I cherish most. Thank you all for opening up to me, and allowing me to open up to you. – Again as the song says “It is good to let you in again”. I am really happy that I have been able to let so many of you into my life (maybe again, or maybe for the first time). My diagnosis has again helped make this possible and I am very happy for this! – Finally, I love all of you as you are and I feel that you all love and accept me for who I am. So…. “please don’t fix a thing, whatever you do”. P.S. Promise to post about the rest of the day real soon!! Morning All!!! With #20 completed I am on to # 18…. I wanted to share “Karri Hour” with all of you. Karri Oksanen was in his early twenties when he was killed last year. I attended high school with him, and his parents are family friends. His family started “Karri Hour” last year as a way to honour his loving, caring spirit. His family writes… “Please join us in dedicating one hour a week to something selfless to help make the world a better place. Visit an elderly relative, help out a neighbour or a stranger, walk a dog from your local animal shelter, or any random act of kindness you can think of. We hope that you will join us in committing your time to help make the world a better place one Karri Hour at a time.” What I am doing today, with my 25 acts of kindness, are in honour of Karri. Please help create good in his memory today, and every week. Share your stories from today, and read other Karri Hour Acts on the website. Thank you all for your support! Off to complete acts #1, 2, 9,12, 16, and #19! I hope everyone had a wonderful Thanksgiving weekend! I certainly have lots to be thankful for this year…. all of you for starters! My big 25 for 25 Celebration is quickly approaching and I am really looking forward to this special day. It is going to be a time-challenge to try to get my list done in one day, but I think thanks to the help of my friends and family I am going to be able to pull it off! If you want to participate but donating blood is not your thing (or you aren’t able to) there are some other options! Over the next couple weeks I will be collecting food donations for the food bank, clothing/toys/housewares for a shelter, and Zehrs receipts to be donated to Big Brothers and Sisters of Guelph. If you would like to donate any of these items please e-mail me and I will be happy to arrange a pick up (lynsey.hodgson@gmail.com). I am also going to be making a donation to Young Adult Cancer Canada, if you would like to contribute this way please let me know. Finally, I will be making food Sunday (27th) afternoon and evening to take to the Youth Drop In Center on Monday (28th) morning. If you would like to help make food, purchase ingredients, or make your own dishes let me know! As always, thank you all from the very bottom of my heart for your continued love and support. I hope to be able to see some of you guys in a couple weeks! Here is a list of 101 Random Acts of Kindness… in case you need some inspiration! If you would like to participate in the Blood Drive, I would LOVE to hear from you!! Still spots to fill late afternoon/early evening. 1. Send a letter/card, or make a telephone call to a long lost friend or relative and renew that relationship. 4. Offer a ride to someone for an appointment, shopping etc. 5. Send a thank you note to a co-worker/classmate, appreciating his/her efforts and contributions. 8. Prepare a favourite meal/snack for family or friends. 9. Share your professional expertise with someone in need of that help. 10. Offer your services of childcare to allow a new mother some personal time. 12. Let someone into line with fewer items than you at the store. 15. Smile, talk, or “hang out” with a co-worker/classmate with whom you may not usually do so. 24. Read to a child. 27. 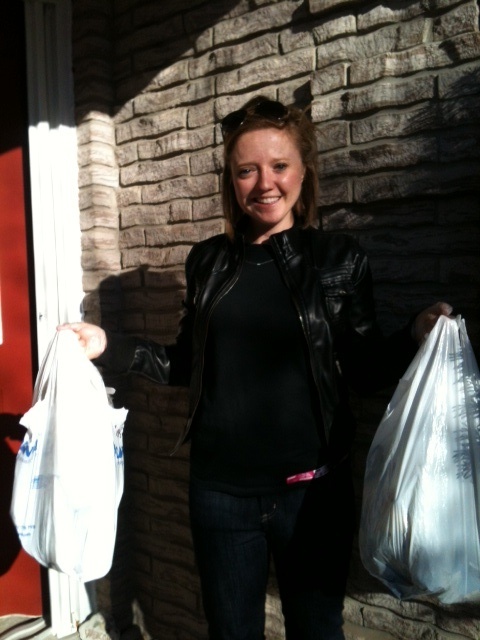 Carry groceries to the car and return the cart for a parent with a child, or a senior etc. 30. Offer your parking space to someone; give your “pay and display” with time left on it to someone. 31. Gather your gently used clothes, toys, furniture, and books and donate to an appropriate organization. 37. Thank/appreciate a business owner/staff person who has provided you with excellent service. 39. Tidy up the staff kitchen at your office/workplace. 41. Pick up clothing that may have fallen off a hanger in a store. 42. Compliment someone on their hair/clothing /job well done. 43. Donate used books to the library. 45. Car pool with someone for the day. 46. Ride your bike to work /school to save carbon emissions and be kind to the environment. 50. Share magazines that you get a subscription to when you are finished with them. 52. Give your time at the food bank or soup kitchen. 54. Let your kids stay up an hour later than normal if it is not a school day the next day. 56. Take your pet for an extra long walk. 57. If you see someone with their tail light or brake lights out, let them know. 58. If you see someone who has locked themselves out of their car, offer to make a phone call for them. 62. Give up your seat on the bus for someone who needs to sit. 63. Visit an animal shelter. 64. Donate a canned item to the food bank. 65. Share your notes with someone who has missed a class or meeting. 67. Put a treat in your spouse/kid’s lunch box. 68. Work or switch a work shift so someone else who needs the time off can do so. 69. Let a group or organization use your boardroom for a meeting. 71. Help with housework for a senior or make their lunch for them. 76. Pick flowers from your garden and share them at work or with neighbours/friends. 77. Get a group together to entertain at a senior’s residence. 78. Offer to cover the receptionist over the lunch hour so she can have an extra long lunch. 80. Have your business offer a Random Act of Kindness Day discount to encourage kindness. 81. Let people cross at the cross walks when you see them waiting. 82. Offer to fix or repair items for someone who doesn’t have the skill set to do it themselves. 84. Form a neighbourhood committee to do a neighbourhood cleanup. 86. Remember birthdays, anniversaries, and special dates and send the person(s) a note or card. 87. Give a friendly welcome to newcomers in your neighbourhood, at work, or at school. 88. Write a reference letter or post one on LinkedIn for someone who is not expecting it. 89. Tutor a student who is struggling with a subject in which you have a skill. 90. Give care packs to the homeless. 92. Tell your staff/employees how important they are to your business. 93. Give your family or friends a kindness certificate that they can redeem for a favour later. 94. Donate or give your season’s theatre/hockey tickets to someone when you aren’t going to use them. 95. Share/email your photos from events with others who attended but didn’t get any pictures. 96. Send a letter of thanks to someone who has made a difference in your life. 98. Thank the crossing guard for taking good care of the children going to school each day. 99. Thank a police officer/fireman and consider what would happen to our community without them. 100. Call your paper provider and arrange to have your paper donated when you’re away on holidays. 101. Fold and/or put laundry away for your spouse/child/roommate.